[product design features] 1. The fabric combination in the bag is fixed first, then double-wrapped, and the strength of the fabric itself, multi-way sewing reinforcement, non-common car side! 2. The handle is made of pure cotton canvas, which strengthens the multi-roll seam on the bag to enhance the weight resistance. 3. The bag body rabbit is specially designed to fold the bottom, which can be folded flat and stored normally, and does not occupy space at all. 4. When unfolding, you can deploy a 1000ml kettle, thermos flask, accompanying cup, small smoldering can, ice tyrant cup, ice tyrant pot to expand the width of the belt, can be said to use a bag!!! **Cups and cans of about 10 cm in diameter can be placed** **The Mason Cup with grip can also be placed in**! 5. 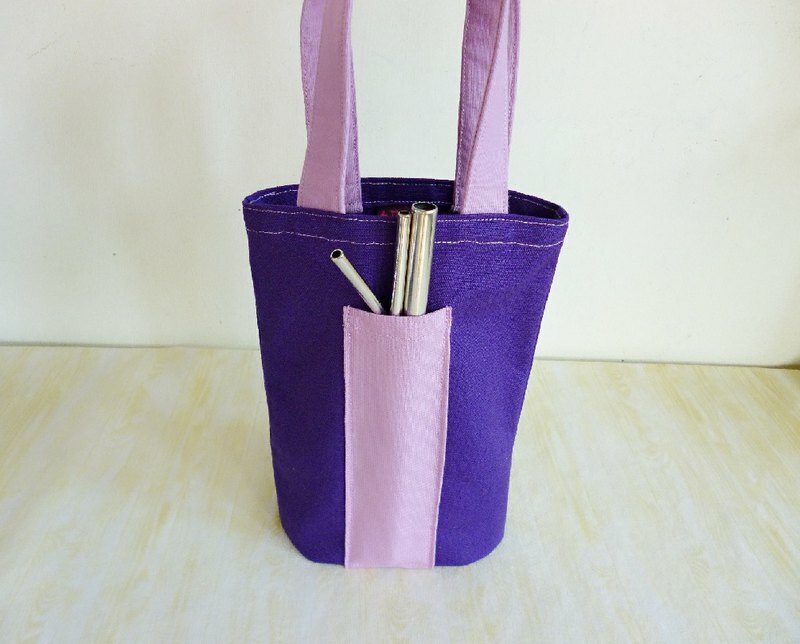 Intimately in the outer bag plus a plug that can accommodate the straw, can accommodate 4 to 5 general straight straws, curved straws, large pearl straws or small spoons can be inserted. ※**There are any questions or special care details**,**Please ask beforehand**,**then make an order action**! [Material and Washing] Thick pound cotton canvas. Generally, the part of the package is cleaned locally. The dirty cloth can be gently scrubbed with a hand towel or a neutral detergent. After cleaning, it can be hung and dried. Cotton canvas can be ironed 【size】 Flat quantity: the bag body (excluding the handle) The center height is about 21cm, and the height of the handle is about 12cm from the mouth of the bag (error is about 1~2cm) [Flower rabbit hand made the original intention and small 叮咛] 1. The handwork and the transmission of love are the original intention of the flower hand rabbit to start selling the hand works. 2. The sales income is used in the rabbits to feed and rescue the waves. **wish to make the world a better place with the power of small bean sprouts** 3. Manually stitching one stitch and one thread, there may be some imperfections. When cutting, the best area is taken, and the drawing will be different. 4. Each person's screen settings are different, so the actual product and the screen display may have a slight color difference. 5. Handmade, perfectionist for color and work, please think twice before buying. 6. In order to protect the parcels from being overwhelmed by the weekly rest, the parcels will not be sent on Friday. 7. On Saturdays and Sundays, the family day and materials procurement processing will be scheduled for one day, and will not be shipped (except for special orders). 8. If you have a specified time limit for the arrival date, please confirm the order before the order, do not place the order directly, and you cannot match the reasonable meeting. 9. Non-24 hours online, please contact us if you have any questions, wait patiently, and the rabbit will reply and deal with it in the first time!